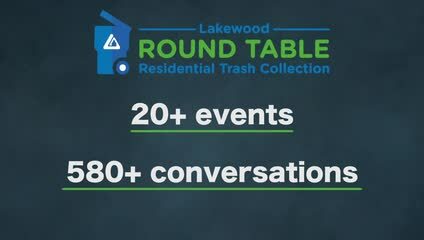 What are Lakewood's community goals for trash and recycling? CLOSED: We are analyzing all of your comments now! If you have additional comments, please email sustainability@lakewood.org. Did you know Lakewood has adopted goals to reduce its greenhouse gas emissions, divert waste from the landfill, and make household costs affordable? The Lakewood Sustainability Plan and Comprehensive Plan include strategies to achieve these goals. Take a look in the Deep Dive section to learn about how the plans were developed and how we plan to achieve our community goals. The planning process for the Sustainability Plan began in the fall of 2013, involving eight open houses, 87 work group participants, and over 450 volunteer hours from Lakewood community members. Six work groups were organized to address a wide range of sustainability topics, including zero waste. City staff, community members, and industry professionals joined residents in each work group to discuss existing challenges and collaborate on goals, objectives, targets, and strategies that would eventually become the Sustainability Plan. Minimize Lakewood’s communitywide greenhouse gas emissions and prepare and adapt to ongoing climate change impacts (p. 26). Make household costs affordable and accessible for Lakewood residents (p.64). Create a culture of zero waste in Lakewood through education, municipal operations, infrastructure, and services (p. 74). Foster sustainable household waste management (p. 82). Reduce communitywide greenhouse gas emissions by 20 percent below 2007 levels by 2025 (p. 26). Reduce communitywide greenhouse gas emissions by 50 percent below 2007 levels by 2050 (p. 26). Achieve a 60 percent communitywide diversion rate by 2025 (p. 74). Achieve a 60 percent residential (single-family residences and complexes with eight units or fewer) diversion rate by 2025 (p. 82). feedback to staff on the vision, guiding principles, goals, and action steps. Promote clean and safe neighborhoods (p. 4-14). Improve air quality and reduce greenhouse gas (GHG) emissions by working toward compliance with state and local air quality standards (p.7-8). Decrease the amount of waste generated (p. 7-16). Increase recycling, composting, and municipal solid waste disposal education (p. 7-17). Increase waste diversion rates (p. 7-17). How do Lakewood prices compare to other Colorado communities? Trash collection costs relate directly to transportation expenses. The more efficient a collection route, the less fuel and maintenance are required, resulting in lower costs for the hauler, that can be passed along to the customer. In Lakewood, Arvada, Fort Collins and several other Colorado communities, haulers operate in an open system, with customers across the city. In other communities, haulers are responsible for a specific area, which allows the hauler to schedule the most efficient routes possible, resulting in lower costs. Take a look in the Deep Dive section to see how rates in Colorado communities compare. ****According to a 2016 Report by Skumatz Economic Research Associates, Inc.
How is trash and recycling collected in Lakewood? Single-family home and town home owners, and homeowner associations (HOAs) in Lakewood sign up for trash collection services through any of the private companies that are licensed to collect trash in Lakewood. The City requires haulers to license annually, but does not regulate services, scheduling, or costs. The City of Lakewood has an open subscription system, which means homeowners must contract with haulers individually. Property owners or HOAs may sign up with any licensed hauler. In order to operate in Lakewood, haulers are required to license with the City, which includes a short application, an annual fee, insurance requirements, hours of operation, and compliance with state and federal disposal regulations. What type of properties are we talking about here? This Round Table discussion is addressing trash collection services for single-family homes and town homes. Commercial and multifamily properties have distinctions, including state law requirements, property management considerations, and other elements that require a separate discussion. How do other cities' trash collection systems work? Communities approach residential trash collection in one of three main ways: 1) Open subscription, which means homes must contract with haulers individually; 2) Organized collection, in which the city contracts with one or more haulers, and residents are assigned to a hauler based on their address; and 3) municipalization, in which the city operates trash collection services. Take a look in the Deep Dive section to learn more about the pros and cons of each. Pros: Customer is free to choose their hauler based on preference; direct relationship between hauler and customer; minimal administrative involvement by the city; easier market entry for new, small businesses. Cons: Typically higher cost; increased truck traffic resulting in air pollution, noise, and road impacts; potentially inconsistent price for the same level of service. Pros: Increased efficiency may result in lower customer cost; decreased truck traffic resulting in reduced noise, air pollution, and road impacts; standardized safe practices; consistency in price and service to customers. Cons: Customer choice is limited or eliminated; increased administrative involvement by the city. Cons: Significant costs for equipment, staffing, and management for the city; Customer choice is limited or eliminated.